Garden Tower Project > Garden Tower > How To Plan A Garden Part 2: To Sow or Not to Sow? I am often asked if it is better to start seeds indoors and transplant them later or to sow seeds outdoors directly into the garden. And what about just skipping seed starting all together and purchasing transplants from a local farmer or garden center? Which is better? Where should I start? Indeed! The uncertainties of life’s big questions are enough to keep an aspiring gardener from ever getting started. The good news is that there are no hard and fast rules in gardening. The short answer to these often challenging questions is . . . it depends. Choosing whether to start your garden from seeds or transplants depends on a number of factors including time, experience, and budget. The type of vegetable or herb being grown also makes a big difference. Some plants prefer being directly sown into the garden, while others prefer to be nursed along indoors before being transplanted. Choosing whether to start your garden from seeds or transplants depends on a number of factors including time, experience, and budget. Here are some benefits and drawbacks of starting seed indoors, in the garden, or going with transplants. Knowing these factors will help you determine the best way to start and get you on your way to growing a happy, healthy garden. Check out our seed starting temperatures chart. All ages enjoy sprouting and caring for life! If you’re planning a large garden, starting from seed is more affordable. You control the source of the seeds and the varieties grown. Start early indoors, transplant, then seed in succession throughout the season. Root crops such as carrots, turnips, parsnips, and beets prefer to be directly sown. 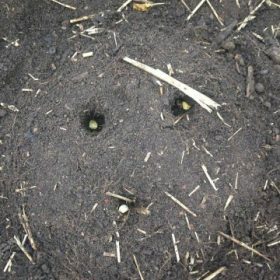 Beans, corn, garlic, and peas also prefer to be directly sown and grown in one place. Weather – if you sow directly outdoors, drought, heavy winds, flooding and insects can destroy young seedlings. Equipment – the cost of protective covering, seed trays, germination heating pads, and indoor grow lights can add up. Start broccoli, chard, and kale indoors and place them outside soon after your plant hardiness zone’s frost-free date. Planning a small garden? It may be more affordable to purchase transplants. Transplants are stronger and more resistant to weather conditions and pests. Celery, eggplants, leeks, onions, peppers, and tomatoes do well as transplants. Transplants can go through shock when moved from their original container. 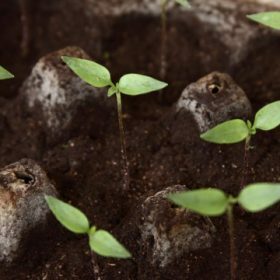 If you start seeds indoors, you will need to harden off your seedlings before transplanting them into a permanent location. Hardening off your seedlings means moving baby plants outdoors (a few hours each day) then back indoors, over a period of a week, while they adjust to sun and wind. Transplants purchased from other farms or greenhouses may introduce pests, diseases, or weeds into your garden. Plant varieties at nurseries and big box stores are limited. If you prefer non-GMO, organic, or heirloom varieties, it may be best to start your own transplants from certified seed sources. When beginning your garden from seed, either sowing directly into the garden or starting in trays, be sure to pay attention to the temperature of the soil. 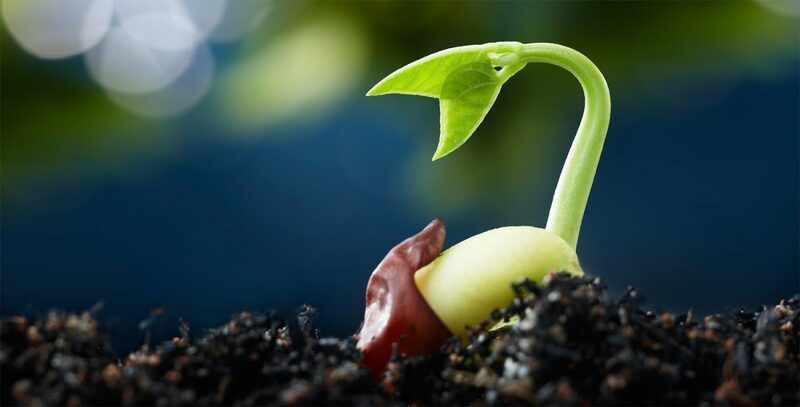 The number of days for seed germination is related to the warmth of the soil. Seedling flat heating mats are great for moving sprout times along more quickly and predictably. If starting from seed isn’t for you, search your local farmers’ market in spring and fall to purchase transplants. These are often heirloom varieties accustomed to growing in your local climate. You can also learn a few secrets of gardening success when buying from local growers. If you’re up for the learning and experiencing the fun of growing your own food, you will end up combining all these ways of starting your garden. Whether buying transplants, starting your own seeds indoors, or starting seeds directly in the garden, you’re bound to be successful if you follow these simple guidelines. This entry was posted in Garden Tower and tagged garden, seed starting, seedling care.